It is 10 am on a Friday in Dubuluk, a small town in Borana region 630 km from Addis Ababa. As they do every Friday, a group of women congregate on the side of the big livestock market, sitting with their gorfa, pear-shaped traditional milk containers made of weaved plant fibers, and selling “ititu,” traditional yoghurt prepared through natural fermentation of whole milk. Locals affirm that ititu is highly nutritious and one of the best foods in Borana. “If you consume a cup of ititu, you can go for a day without feeling hungry” declare the women. In the past, selling of milk or ititu was considered taboo for Borana pastoralists in southern Ethiopia. But things are now changing. Milk and derived products, whether from cows, goats, or camels, are an important contributor to nutrition in communities in this area, especially for children, and are culturally very precious products. 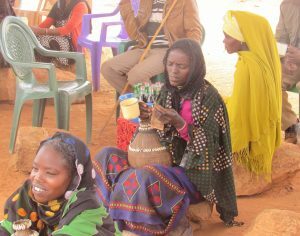 Also, producing and selling of milk-derived products, such as butter or fermented milk, represent important-- often the most important -- sources of income for women in these pastoralist communities. Women are in charge of the entire transformation process, and very often manage the revenues from sales of the dairy products. Supporting its production is a direct pathway to empowering women and their families and helping meet the nutritional needs of these remote and food insecure populations. Traditional dairy processing uses very basic equipment, mostly made from locally available materials: animal skin, wood, plant fibers. Similarly, cleaning and disinfection practices are based on traditional methods, such as smoking (discover the fascinating process of smoking in this video). 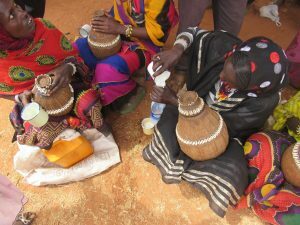 These basic handling practices, coupled with animal health challenges and limited water and sanitation facilities, raise questions about the safety and quality of the products, Not only could they be compromising people's health, but also preventing sellers from accessing new markets, and new sources of income, outside the pastoralist areas. Third, the project will measure both the suitability and community acceptability of stainless steel containers as a more hygienic alternative for milk processing, compared to the traditional equipment. The lessons learned will guide researchers and development practitioners on available options to improve safety of the milk products that are feeding some of the most vulnerable populations in Ethiopia, and help open avenues for these communities to access larger markets and improve their livelihoods. Silvia Alonso is a scientist at the International Livestock Research Institute and Kebede Amenu is an associate professor at Addis Ababa University.